There will be plenty to watch as Dustin Pedroia takes the field this spring. The famously hard playing second baseman is back in camp at Fenway South preparing for a real return to action this season. Pedroia appeared in just three games in 2018 after recovering from knee surgery in October 2017. Before an injury-shortened 2017 Pedroia was highly effective the year before, slashing .318 AVG/.376 OBP/.449 SLG with 15 home runs and 74 RBI over 154 games. His 117 OPS+ in 2016 was his best such mark since a career-best 131 OPS+ in 2011. A bullpen without Joe Kelly, Craig Kimbrel, or any significant replacements for them has to be a concern for Red Sox fans as we head into the new season. For their part, the Sox are counting on a now healthy Steven Wright and also turnaround from Tyler Thornburg, who has been working with Hall of Famer Pedro Martinez. Thornburg says his off-season has been focused on improving. “All day, every day in the off-season was trying to get better,” Thornburg told NBC Sports. “Trying to get to where I know I can be, where I want to be. That was pretty much every day in the off-season for me.” Thornburg owned an outsized 5.43 ERA last season over 25 appearances in 2018, his first major league action since Boston acquired him in December 2016. Expect a rotating cast of characters on Red Sox radio this season. The braintrust at WEEI broke up a good duo when they let Tim Neverett walk away after three years broadcasting games alongside Red Sox Hall of Fame broadcaster Joe Castiglione. Eschewing any value that can be attributed to consistency, Sean McDonough, Chris Berman, Josh Lewin, and Mario Impemba will presumably be trying out for the permanent gig as will station personalities Lou Merloni and Dale Arnold, and NESN’s Tom Caron. Los Angeles is the chief beneficiary of EEI’s folly with Neverett signed to a radio and TV deal with the Dodgers. It’s hard not to hear the strains of Reunited while reading about Jorge Posada‘s latest gig. The former Yankees backstop was hired on by Marlins’ CEO Derek Jeter as a special advisor with unspecified responsibilities. Jeter and Posada were the nucleus of the Yankees’ glory days. Posada retired from baseball in 2011. Former Red Sox steedster Jacoby Ellsbury, who missed all of 2018, won’t make it on time to Yankees Spring Training this year, ailing with plantar fasciitis. Boston certainly got the best of young Ellsbury who never performed in pinstripes the same way as at Fenway. New York remains on the hook to Ells for $21 million this year and next before the relief of a $5 million buyout in 2021. Former Red Sox pitcher Doug Fister, 35, has decided to retire. The 10-year major league veteran spent 2017 with Boston going 5-9 with a 4.88 ERA over 18 games (15 starts). Despite a mild winter here in the Northeast (at least so far), the calendar has a ways to go before it’s officially spring. All the same, your World Champion Boston Red Sox (and that has a nice ring to it, doesn’t it?) are in camp at Fenway South in Florida. If you can swing it, a late winter trip to JetBlue Park in Fort Myers is a lot of fun and well worth your time. I took in a few games there before the 2017 season and came away impressed with the park and the incredibly friendly staff, many of them ardent Sox fans who have retired to the Sunshine State. 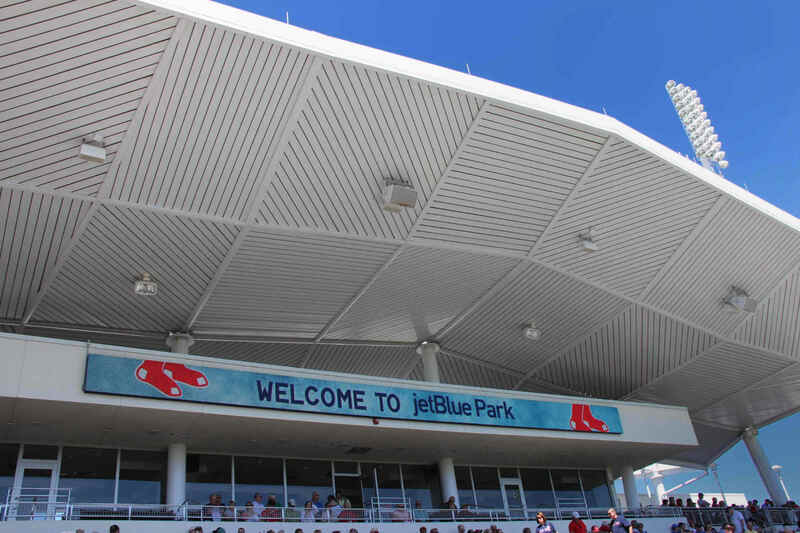 The Red Sox will play 30 Spring Training games in Florida this season, 16 at JetBlue. Spring games aren’t your typical affair. Most feature only a handful of regulars. Given the short off-season following last year’s World Series campaign, this year’s Sox spring will likely feature even fewer regulars for these exhibition games. Still, it’s an excellent chance to see up and coming prospects like Bobby Dalbec, Tanner Houck and Durbin Feltman in what’s typically a beautiful summer-like atmosphere. Though Spring has a carefree vibe overall, there are some interesting story lines to monitor, not the least of which is the return of 35-year-old Dustin Pedroia. Cora is the subject of an MLB Network documentary that airs for the first time on Tuesday, February 12th at 9 PM Eastern. You’ll find repeat performances in your local listings. Where in the world will former Sox closer Craig Kimbrel land? With the start of spring he’s still unsigned. Despite a shaky postseason, Kimbrel gave Boston 62.1 IP of 2.74 ERA pitching over the last regular season, to say nothing of 65.2 IP from Joe Kelly, who is now with the Dodgers. Baseball president Dave Dombrowski hasn’t made a major move to recover that production and the bigger looming question is who on the current roster can cover the deficit? You’ll see MLB 150 patches on the right sleeves of major leaguer uniforms in 2019. The patch commemorates the 150th anniversary of the 1869 Cincinnati Red Stockings, the first all-salaried pro baseball team (that group, incidentally, went 57-0 that season). This year’s Reds will go the extra mile with 15 throwback uniforms worn throughout the year. “The MLB 150 patch will be a continuous reminder on the field of the link everyone involved in the game today has with the storied history of professional baseball,” said MLB commissioner Rob Manfred. Major League baseball honored the 100th anniversary of the milestone team in 1969 and later again in 1994 on the 125th anniversary. One-time Red Sox reliever Junichi Tazawa has signed on to a minor league deal with the Cubs. Taz, now 32 years old, has seen decreasing major league action since leaving Boston in 2016. Though he signed a big $12 million contract with the Marlins in 2017, Tazawa made just 77 total appearances with them over parts of two seasons before heading to the Angels for nine games at the end of last season. Forget the disabled list. Effective for 2019 MLB is renaming the DL as the “injured list.” The move, which was communicated to clubs in December, was made at the suggestion of advocacy groups for the disabled. The rules for using the injured list in 2019 remain the same with a 10-day version for short-term injuries and a 60-day version for longer-term set backs.